It's all happening: Our new high-end sleeping areas at all locations for dogs booking for overnight care. While all pets are treated with loving care and comfort, some dogs need extra attention and more posh surroundings. 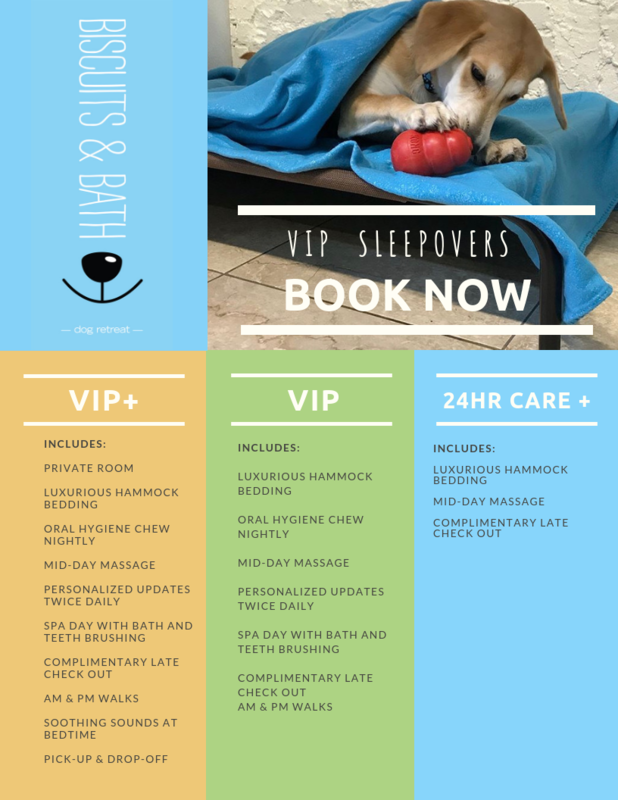 If you want your dog to be treated like royalty, you can book the VIP+ level of care. They will be showered with attention, treats, and concierge-like service, while being in our most comfortable living space. Whether your pet is having a weekend with friends in 24 Hour Care+ or having a personalized, A-list treatment with the spa-like VIP+, you're sure to be pleased with B&B's boarding. Dogs come home relaxed, happy, and are always excited to see you! Bon voyage! Biscuits & Bath Location Upper West Side - 265 w. 87th st. @ broadwayUpper East Side - 1535 first ave. @ 80th st.Park Ave - 1067 park ave. @ 87th st.Midtown East - 1035 third ave. @ 62nd st.Lincoln Center - 160 riverside blvd. @ 68th st.Midtown West - 229 w. 60th st. @ AmsterdamWest End - 21 W. End Ave. @ 60th st.Sutton Place - 1064 first ave. @ 58th st.Murray Hill - 487 third ave. @ 33rd st.Greenwich Village 41 w. 13th st. @ fifth ave.Tribeca - 73 hudson st. @ worth st.Financial District - 71 broadway @ rector st. Some services are time sensitive, subject to availability, and are dependent on the operating hours of the particular location. Check our location webpage for hours of operation. For quotes and general information call 212-419-2500.